In the list below, I discuss some of the common reasons for wanting to get organised. And you can use these to springboard into working out your reason or reasons. 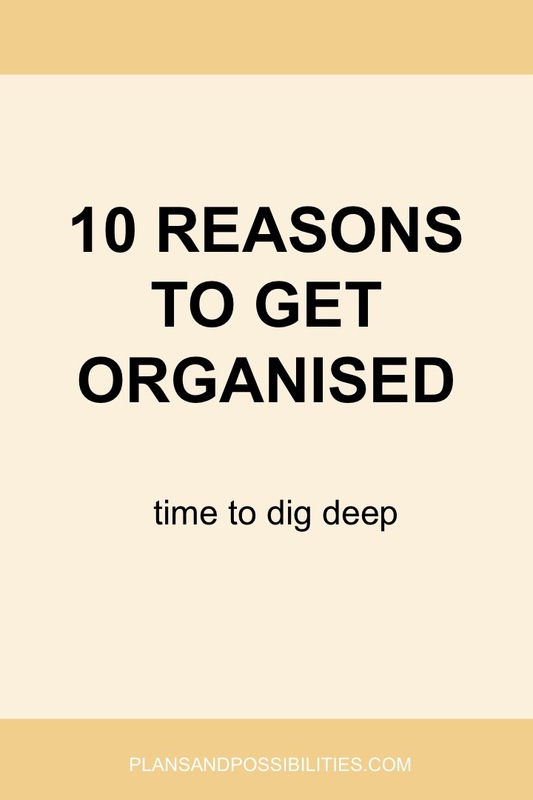 So without further ado, let’s look at some reasons for getting organised and see whether they resonate with you. It used to be a daily occurrence where I’d make a mad dash out of the house running late yet again because I had 'nothing to wear' in the morning. Thankfully those days are over and I’ll spill my secrets in another post, but today, I share this to illustrate just one way that getting organised has helped me save time. It took time (and money and effort!) to create a closet I loved (from choosing colours and style to storage and outfit planning), but I am now reaping the rewards of the upfront work every.single.day. There’s no more indecision or delays to my morning routine, which frees up a few minutes every morning that I can then use for something else. What things use up a lot of your time in your life, especially things you do everyday or frequently? A little bit of prior planning or using a system or template could save you time on a regular basis. We only have so much energy each day and it is rapidly depleted when our days are haphazard. It becomes a drain when we constantly spend our days looking for misplaced items that we haven’t given a consistent home or when we’re juggling an overloaded to do list or don’t eat well because we didn’t give our meals much thought. Getting organised, for example, by planning our outfits and preparing our meals in advance frees us up to use our energy for other things. I remember one year where I received parking ticket after parking ticket, it almost became a monthly expense! I soon realised that the main reason I was getting caught short was because I never had the right amount of loose change to pay for parking. So on a free afternoon from work, I headed to the bank and got coin bag after coin bag of suitable change. I decanted most of it into the car and I am pleased to say I never had a problem paying for parking again (now I can pay using my phone, even better!). That’s just one instance where being organised saved me money, there are loads more. Being organised enough to make lunch to take to work can cut expenses. Paying our bills promptly avoids late fees, interest and other charges. Organising an exercise schedule, our workout clothes and equipment means we are more likely to stick with it. And we all know regular exercise is great for our bodies. In addition organising nutritious meals and snacks benefits our health too. A definition of stress that has stuck with me is: how we feel when what is asked of us is greater than what we can give. It’s pretty much commonplace in modern living, but we can reduce it to a minimum. Getting organised enables us to systematise things that can be systematised (it doesn’t work for everything), which frees up our energy to handle things that crop up unexpectedly. When we take time to look ahead we can identify situations or events or tasks that we don’t want to handle. Then we can delegate these to others, refuse them or schedule them for a time when we can handle them. Before I made serious headway with getting organised, I would frequently lie in bed at night with this feeling that I had forgotten something, but couldn’t quite remember what! I must admit, I was so zonked that I didn’t lay there awake for very long! Once I started making to do lists and setting up reminders, things improved and I could sleep easy in the knowledge that I had a handle on things. What we eat also affects our sleep, so if we plan and stick with eating healthy meals, this too will improve our sleep quality. When we get organised, we can achieve so much more. Several years ago, there would have been no way I could have started a blog with the way I was living. Now that I have set up simple systems that suit my lifestyle I have freed up a tremendous amount of time and energy. And this has directly enabled me to achieve more in almost every area of my life. I love the feeling that comes with having a plan. It doesn’t mean that everything goes according to the letter of the plan, but having a plan gives me peace of mind. And then working that plan with any changes that arise, gives me a feeling of accomplishment. When I reflect on my week and think about all that has happened, and look at all the items I have crossed off my to do list, I feel accomplished. That feeling can be magnified when we then look at the bigger picture of what we are working towards in life. Once you’re on the road to getting organised, you’ll find your personal standards are raised. You’ll develop better habits, think clearer thoughts and feel more at peace. And that will impact every area of your life. It may not be an obvious reason to get organised, but trust me on this one, it's true. When I first started out on this journey to get organised, I distinctly remember thinking, gee life is about to get boring, having everything planned out and set by a schedule is so restrictive. I was so very wrong! Having the big areas of our life planned out frees up gaps in our life for us to be spontaneous. We're able to seize opportunities when they arise, partly because our life is in order and partly because we know that we will use the same skills to organise that new opportunity that we have been using to organise our everyday lives. And there you have it, ten good reasons to start organising your life. Don’t stop at just organising your wardrobe or your home. Keep going and organise it all, life afterwards is so much more rewarding.